I am a certified Ironfool. Having said that, I have no desire to do another full ironman soon. Ironman 70.3 yes, but full Ironman no, at least not now. To date, I have done six ironman 70.3 races (seven if you count the Desaru long distance tri which is the same distance but just not organized by the Ironman group). 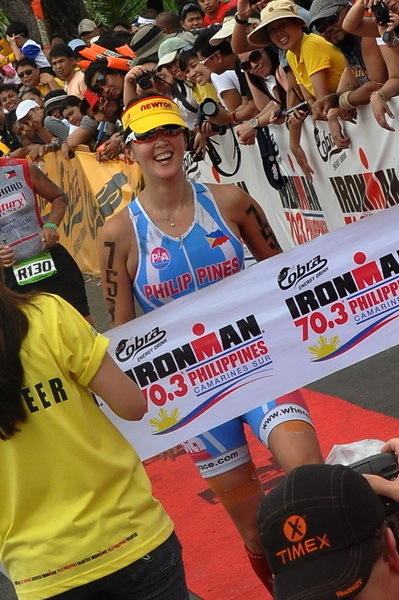 The 2011 Ironman 70.3 Philippines in Camsur would be my seventh. Unfortunately, training was not going well. I was managing a two year old recurring hamstring injury that left me feeling like there was a shotput in my hamstring every time I ran. Not a good feeling. Despite this setback, I continued training with the objective of just participating and having fun, never mind being competitive. Then to complicate matters, I learned they opened up slots for the Ironman World Championships in Kona for the winners of the Ironman 70.3 Philippines. For most triathletes, that is like God giving you a ticket to heaven. My friends stepped up their training. Everyone wanted that slot except me. “Are you crazy?” they asked. No, I just don’t have the interest in putting in all the training hours. I dread the thought of waking up in the dark and riding my bike for seven hours. Really? I never even bothered to check who had signed up in my age-group. I continued to do my minimalist training. It was clear, even if I won, I WOULD NOT TAKE THE SLOT FOR KONA. Argggh, I couldn’t believe I was considering it. And then, I crossed the point of no return. I asked my worldly, political savvy but non-athletic brother his opinion. It’s the World Champs! Of course you will take the slot! Okay, I’m doomed. Looks like I will take the slot, if I win my age-group. So, come race day, I went out there and raced passionately as I always do. I was the strongest in my age-group and unless I got a flat tire or cramps, I would be going to the World Champs. My swim went well. My bike went magnificently. And then I surprised even myself by running well too. Despite the hamstring injury, I was putting in good time. On the last mile before the finish line, the only thing on my mind was finishing strong, Kona was already mine. And then out of nowhere, this streak of blue ran pass me. I couldn’t help but notice her because she was sprinting as if she only had 100 yards to go. I couldn’t help but think she won’t make it to the finish line at the rate she was sprinting. As I stared at her at her back, I noticed the name Celma printed on her tri-suit. Celma? That’s the name of one of the girls in my age-group! She just passed me. And she’s running like her life depended on it. And it probably did. She must have wanted that Kona slot so badly that she was willing to run until she dropped. I knew that the only way I would catch her is if she cramped or passed out. And at that moment, I looked up to the skies and said “Thank you Lord.” I did not want to go to Kona. And with that I picked up my pace thinking that I still owed it to my competitive self to give it my best shot, just in case, she did cramp or pass out. She didn’t. She crossed the finish line about a minute or so ahead of me. I crossed the finish line in search of her, wanting to congratulate her for her strong finish… and to thank her for keeping me from Kona. I learned later that a Canadian finished much earlier than both of us and was the one who qualified for Kona. At the awarding, I finally met Celma, I gave her a hug and congratulated her. 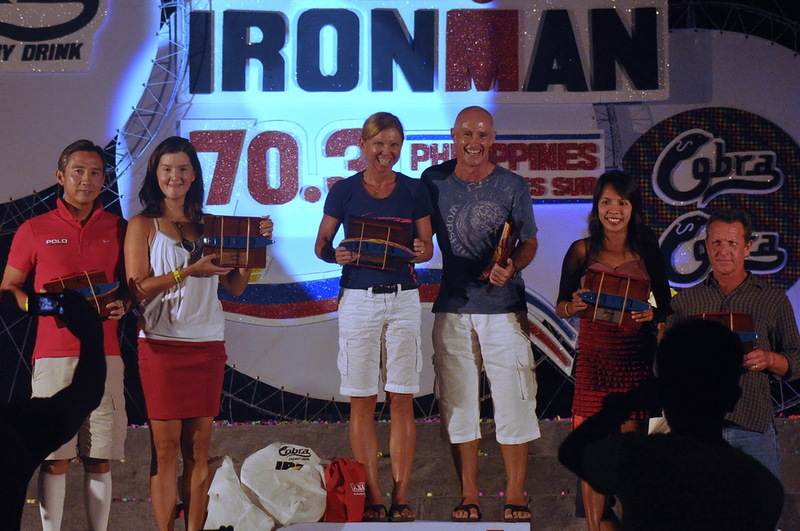 Then I proudly took my place on the podium as the third placer of the Ironman 70.3 Philippine race in my age group. I couldn’t be happier knowing I was not going to Kona. Top three winners of my age group.